When I started planning this trip I immediately bought some guidebooks. There is a ton of information on the internet but I wanted hard copy to peruse on cold winter nights. 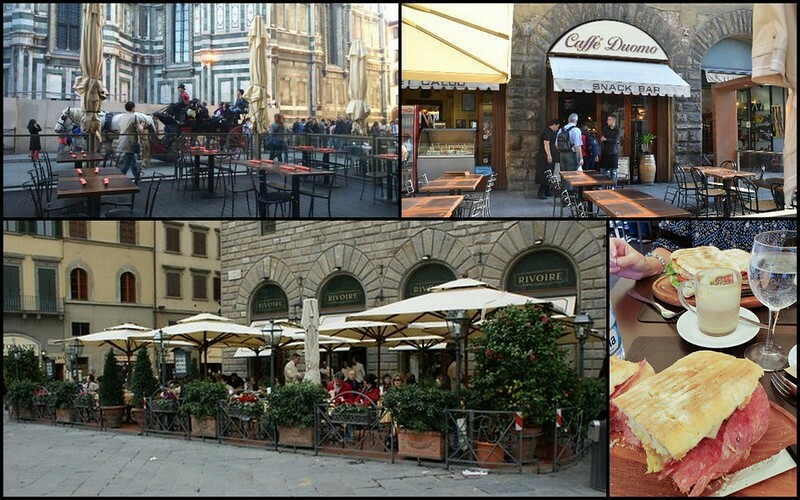 I had Rick Steve’s Florence and Tuscany, and Lonely Planet Florence. I read and read, studied maps, walked around the city using google street view, and tore out the hard copy map. Isabella had said, “Always look for the Duomo, it will keep you oriented”. What she didn’t say is that the huge dome of the Duomo is not visible when you are wandering the narrow canyons that are the streets of Florence. As Deanna and I must have said a thousand times, “Thank goodness for Google Offline Maps!”. 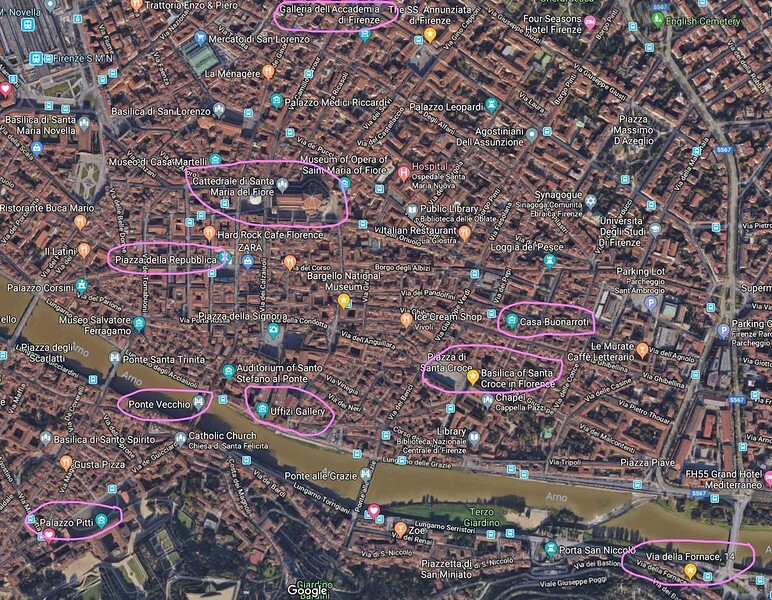 I have no idea how one would navigate Florence with only a paper map. We dressed comfortably for the warm day ahead, making sure that we also had appropriate leg and shoulder coverings for the churches. 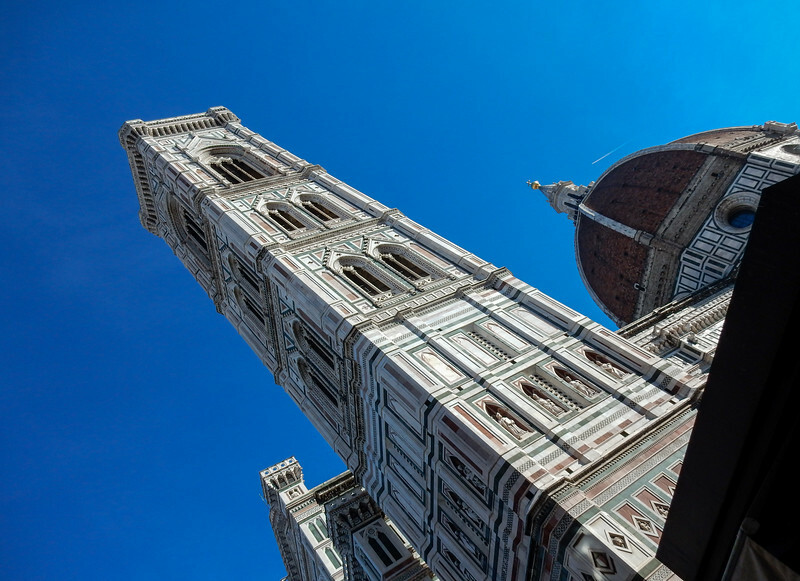 The only way to begin to understand Florence is to head first for the piazza of the Duomo, formally known as the Cathedral di Santa Maria del Fiore. 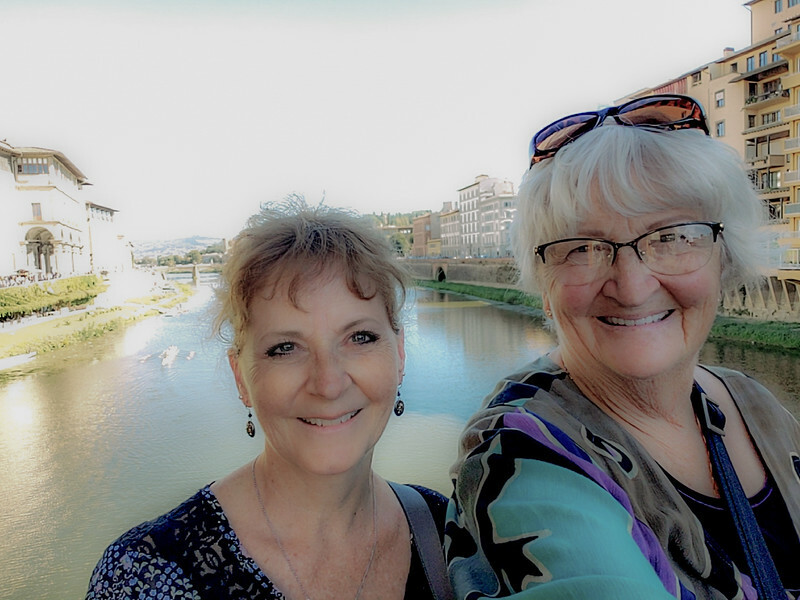 Our apartment on the east side of the Arno River is about half an hour’s walk from the Duomo, and on that first morning we chose to walk the west side of the Arno River toward the Ponte Vecchio. 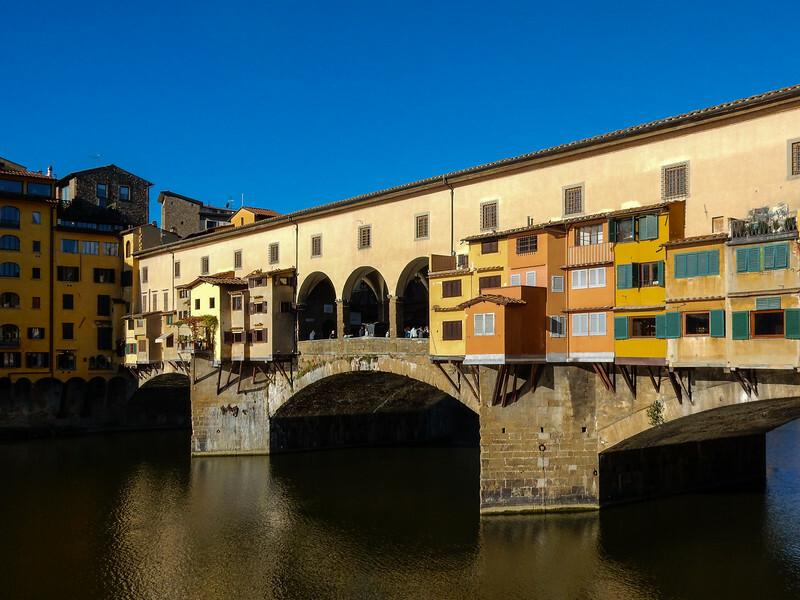 Built in 966 very close to the original Roman crossing, the Ponte Vecchio, or “Old Bridge”, was the only bridge across the Arno in Florence until 1218. The current bridge was rebuilt after a flood in 1345. 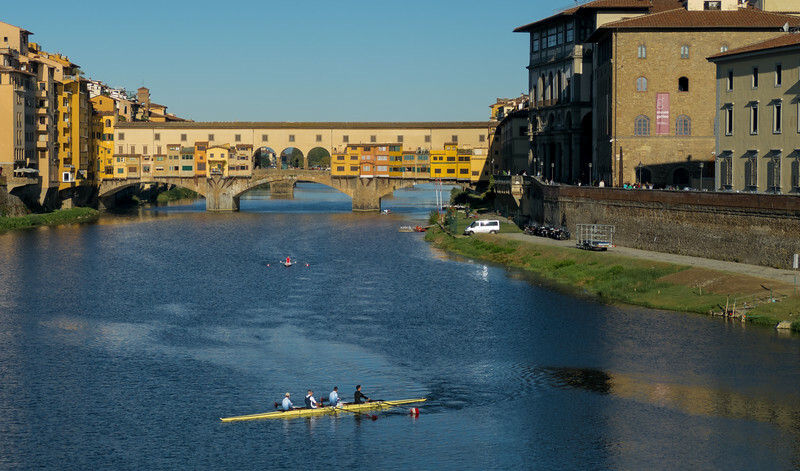 During World War II it was the only bridge across the Arno that the fleeing Germans did not destroy. Instead they blocked access by demolishing the medieval buildings on each side. On November 4, 1966, a devastating flood destroyed much of downtown Florence but the bridge miraculously withstood the floods. 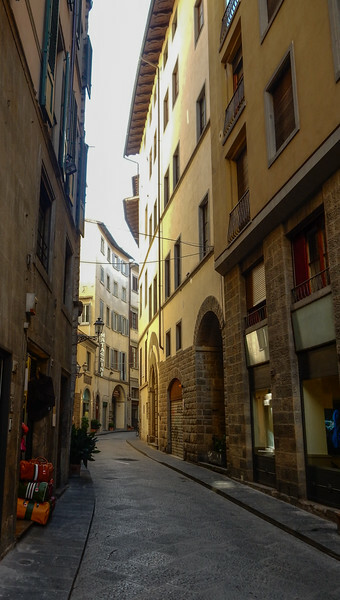 There have been shops on Ponte Vecchio since the 13th century. Initially, there were all types of shops, including butchers, fishmongers and, tanners, with the associated rank smells. Understanding the history of the Medici’s is central to understanding Florence and the Renaissance. Their wealth and power during the 15th century was unprecedented. They decided that the smell wasn’t acceptable and in the mid 1500’s, Ferdinando I de' Medici, Grand Duke of Tuscany, decreed that only goldsmiths and jewelers be allowed to have their shops on the bridge in order to improve the wellbeing of everyone, including that of the Medici as they walked over the bridge between their offices at the Uffizi buildings and their home at Pitti Palace on the opposite side of the Arno River. The bridge looked interesting in the morning sunlight with rowers from the local elite rowing club on the water. We were glad to be walking rather than driving as traffic was crazy all around us. Even walking was a bit of a challenge on the narrow footpath along the river with crowds lining up and couples stopping to take photos of the famous bridge. We didn’t realize that we were in front of the famous Uffizi Gallery when the foot traffic got really thick, and we had to thread our way through the crowds to try to get past the entry lines. On that first morning, we didn’t know much. It is fun to look back on that first wandering walk and compare it to how much we learned of the city in the ten days or so that followed. It was a bit intimidating, but not really too much as we continued to wander in the general direction of the Duomo. We turned at a side street just past the bridge, and there was the gorgeous red dome of the famous Duomo, gleaming in the morning light. The cathedral is huge, and the complex includes not only the main cathedral, but the bell tower, “Campanille” and the Baptistry. 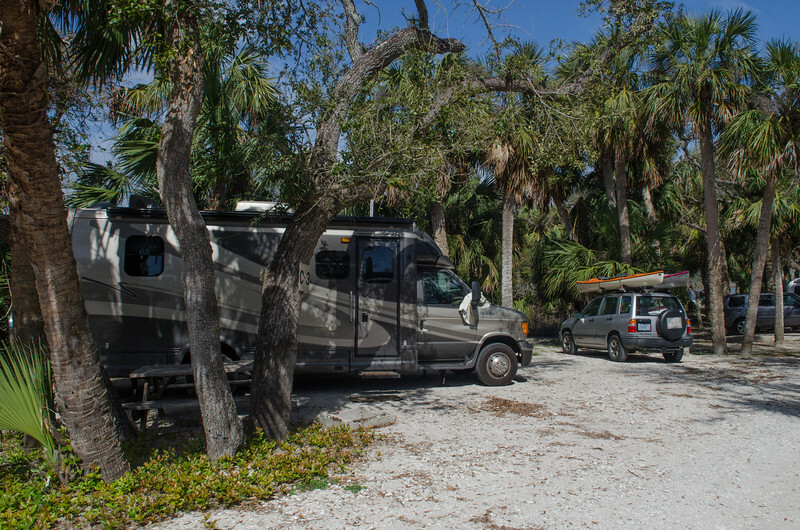 Our plan for this first day included no formal tours, with the idea that we would wander, get to know the place a bit from the outside before venturing inside any of the famous cathedrals and galleries that we planned to visit. T hat plan worked out fairly well. We had read that the only way to begin to deal with the huge crowds of tourists was to begin the day early, and we were in time to get tickets to climb the bell tower without having to wait terribly long in the lines. Even at that early hour, around 10:30, the lines for entry into the Duomo itself were all the way around the block and would be at least a 2 hour wait. Lucky for us, not many folks were excited about climbing the stairs of the bell tower. 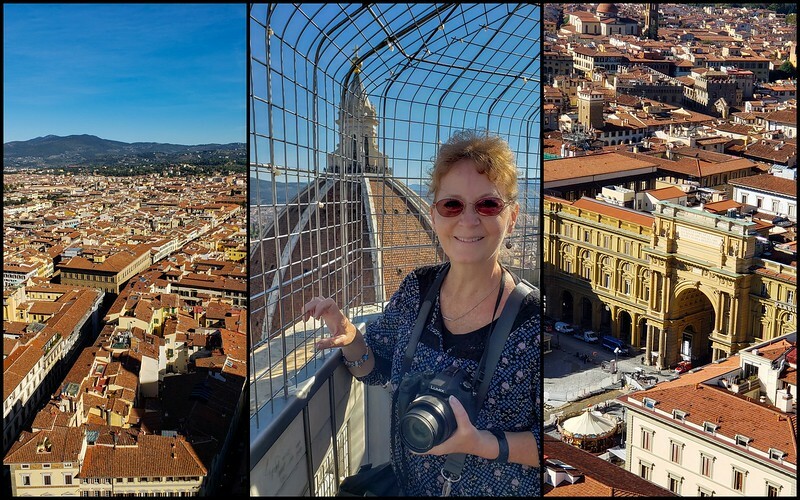 It is the tourist thing to do to climb the Duomo, but the guidebooks suggested that climbing the bell tower actually provided better views and the line was often much shorter. The guidebook was right! We did have to stand in line at the Duomo Museum building, around the square some distance to get tickets for the bell tower. At that time we also got an entry time to climb the Duomo, with the first time available being the following Friday night. Hurrying back to the bell tower line we discovered that in just the few minutes it took to get our tickets, the line had grown quite a bit. Still, the wait was tolerable. The ticket taker looked askance at my walking stick and my white hair and made sure that I knew the bell tower was 414 steps to the top. Giotto was a painter and architect from Florence during the late middle ages. 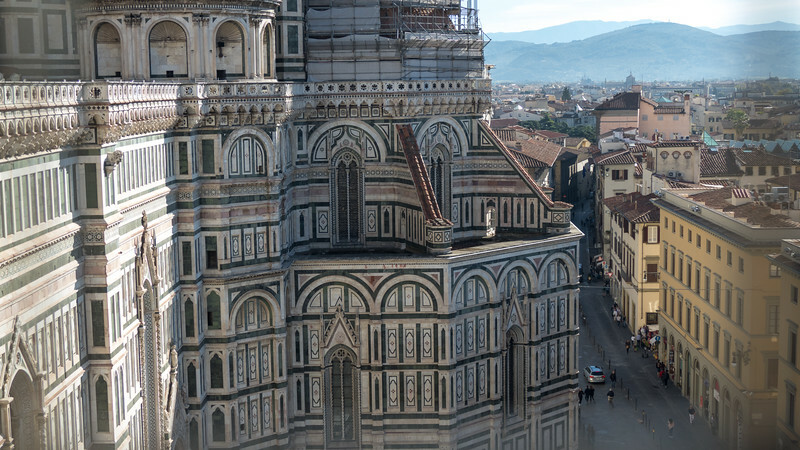 He was the main architect for the graceful "Giotto's Campanile" as the bell tower of the Cathedral of Santa Maria del Fiore is called in Italian. 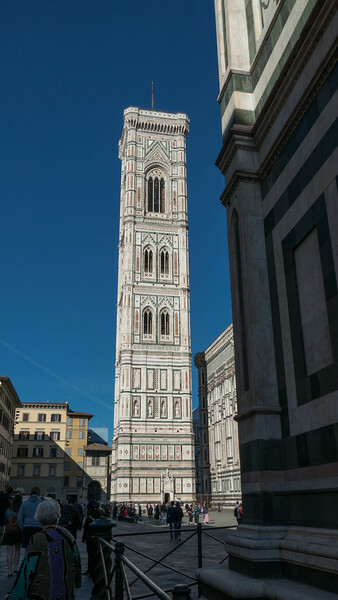 The tower is a beautiful example of Florentine gothic architecture of the fourteenth century. 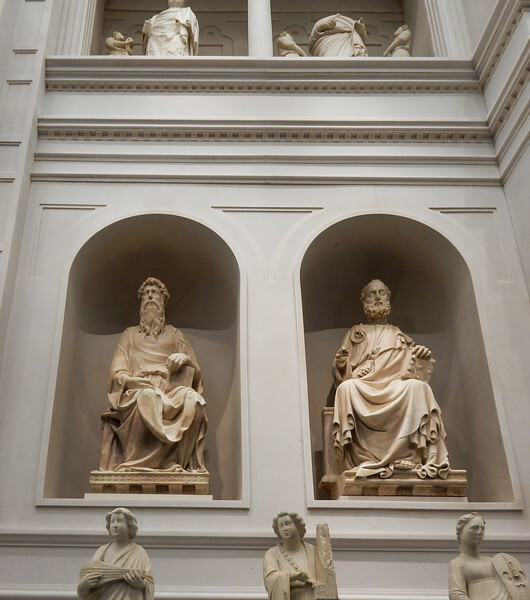 As we began to explore the beautiful churches and museums of Florence, the evolution from the Dark Ages and the Gothic period to the brilliant realism of the Renaissance in art and architecture was evident everywhere. This was the heart of Florence, the reason is it such a magical place to experience the leap that mankind made during the Renaissance. Deanna and I didn’t notice the diamond shaped sculptures here until AFTER we saw the real ones in the museum. Giotto began the construction of the bell tower in 1334, and it was completed after his death in 1359. The bell tower is 269 feet/82 meters high and requires climbing all 414 steps to reach the top. 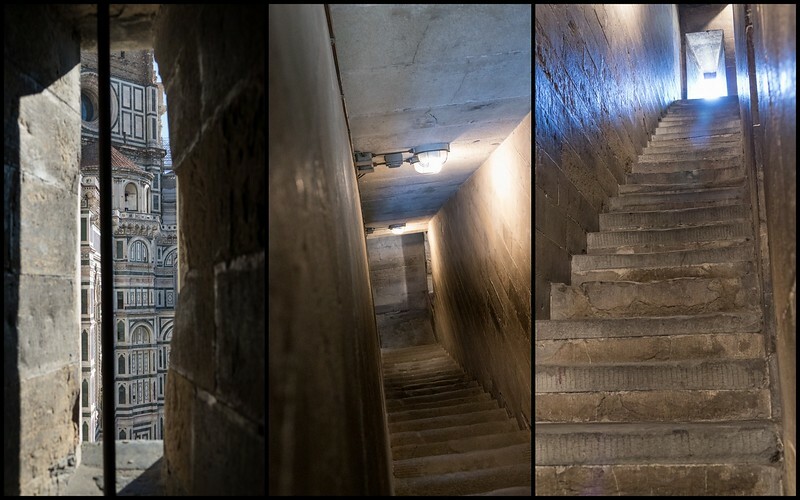 The climb up the tower isn’t terribly difficult and there are three open middle floors where you can rest and enjoy the view.The steps are rather narrow and it is the only way up and down, so you need to share it with people going in both directions. Everyone is quite polite, with bodies grazing each other in the narrow space, and lots of laughter. 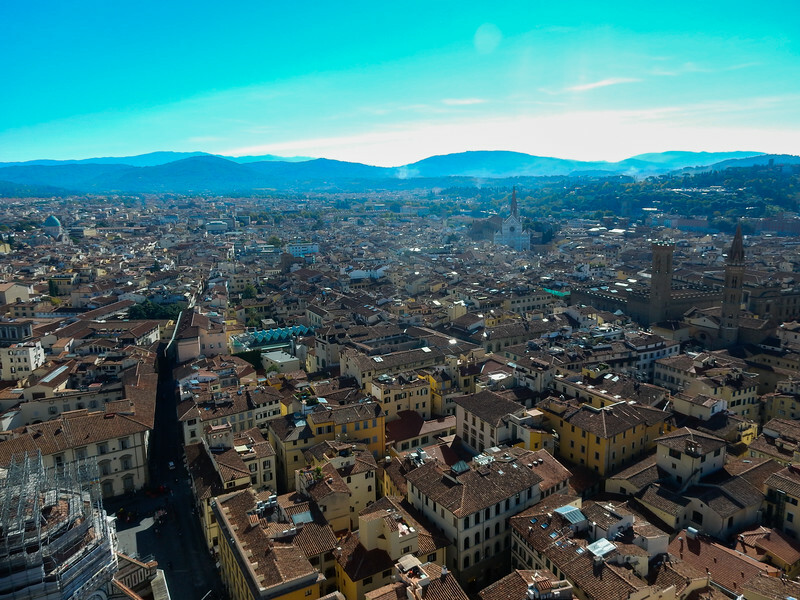 The view from the top was thrilling, with red tiles roofs far below us in all directions, the narrow winding streets of Florence looking like a huge maze. 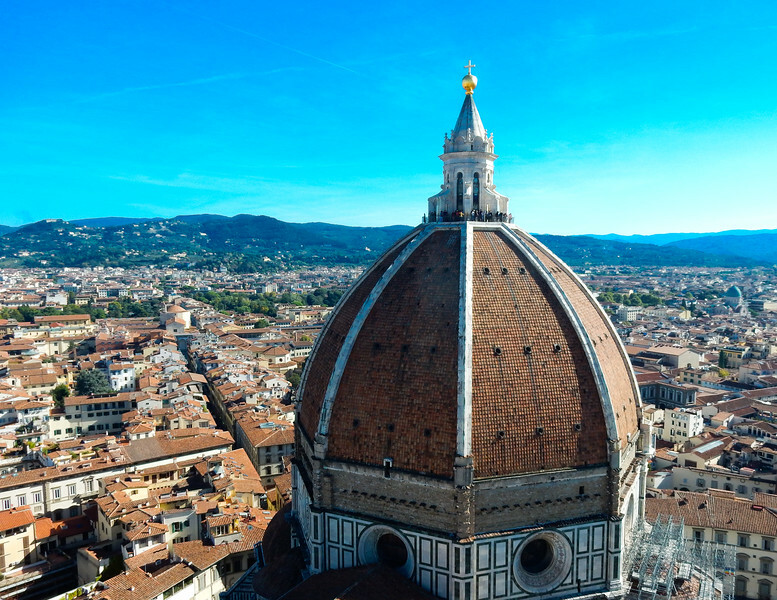 We had a gorgeous bird’s eye view of Brunelleschi’s Dome, (more about that in another post). Going down was easier on the legs and lungs but harder on the knees and balance. Once again, in the narrow stairways on the crooked steps, I relied on Deanna’s shoulder in front of me for balance.Once we were back in the piazza, lunch seemed like a great idea. We were hungry! The shade under the umbrellas look very inviting and a cool drink would hit the spot. Lunch was not inexpensive, but so delicious. Italian salami, cheeses, more fabulous tomatoes, and panini bread that was done to perfection, crispy but tender. As always, the question about water, sparkling or still? No such thing as tap water in a glass in most Italian eating establishments.Topped off with a cappuccino as we watched the crazy crowds milling about it was a delightful treat. The tickets we had purchased earlier at the Duomo Museum included the Bell Tower, the Duomo, the Baptistry, the Crypt, and the Duomo Museum. There were many reasons to visit this museum, but I had an agenda: it was time to view my first Michelangelo sculpture. 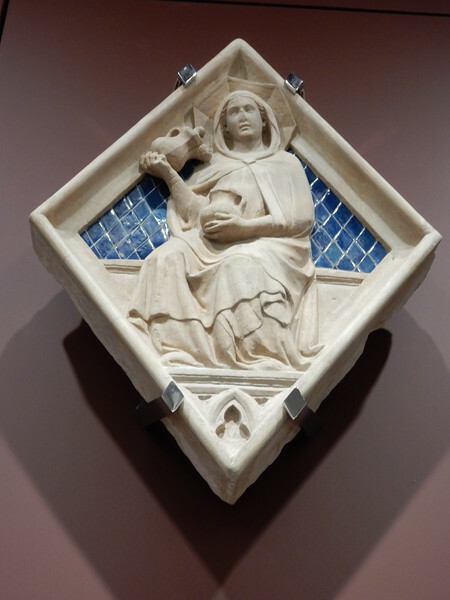 However an even more important reason to visit this beautiful newly remodeled museum is that almost all the original sculpture from the facade of the Bell Tower and the Duomo is here. In order to protect the priceless art from vandalism and the weather, copies have been made for display in their original locations and the actual pieces are inside the museum. 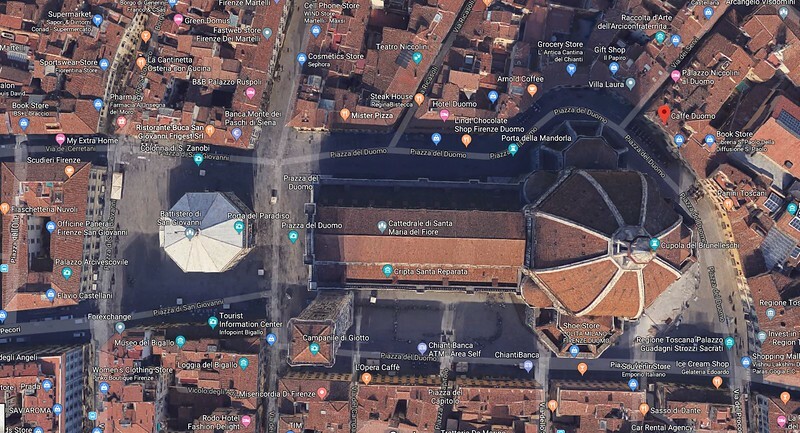 While I was searching around on Google attempting to locate the Caffe Duomo as I was writing this blog, I suddenly found myself right inside the museum with a 360 view. Google is now doing interior spaces of some of these great world treasures. Before you continue with my story, check out the link here. Deanna, this means you too! You will be amazed! The interior of the museum is a newly recreated facade of the original cathedral with the sculptures in place as they once were on the exterior of the church. The display of sculpture by so many artists was thrilling, with familiar and unfamiliar names from old art history classes. 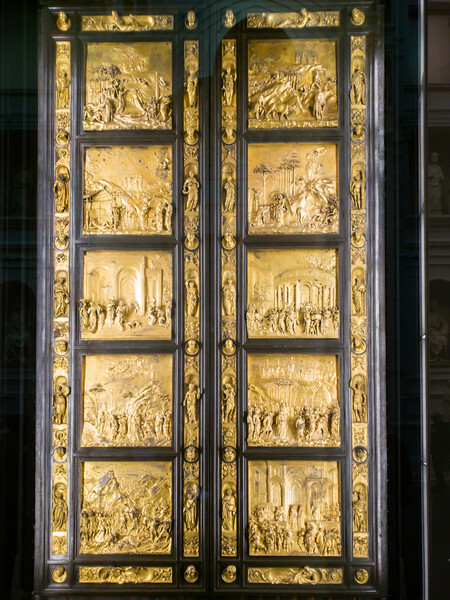 Viewing the original Ghiberti Baptistry doors is so much better than seeing the copy from the street at the Baptistry. According to some, the Renaissance officially began in 1401 with a citywide competition to build new doors for the Baptistry. Lorenzo Ghiberti won the job and built the first set of doors for the north entrance. He was later commissioned to create another set of doors for the east entrance, facing the Duomo. These bronze “Gates of Paradise” revolutionized the way Renaissance people viewed and depicted the world around them. In room toward the back of the building, showcased in a way to honor the artist, is the Pieta by Michelangelo. This is his later Pieta, unlike the one in the Vatican which is so famous. I was close enough to touch the marble, but of course I wouldn’t think of it. If you reach your hands toward any of the art loud alarms will go off triggered by the lasers that protect the pieces. 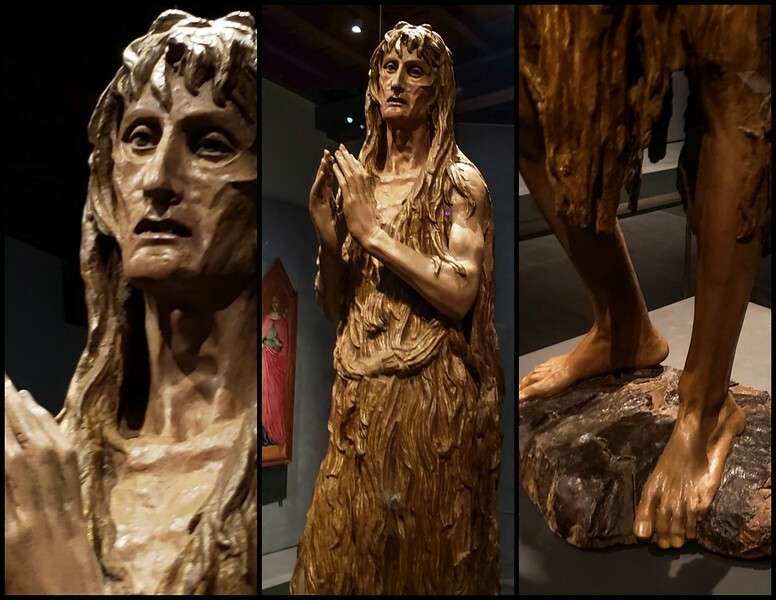 A work of art that isn’t exactly beautiful but is so compelling is the wood carving of Mary Magdalene by Donatello. 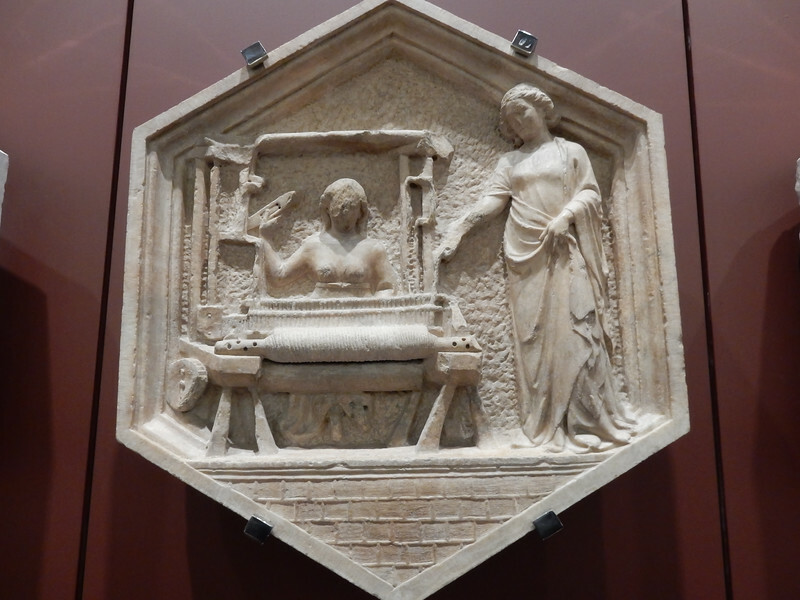 Donatello as a sculptor preceded Michelangelo and was at times a mentor to the younger sculptor. 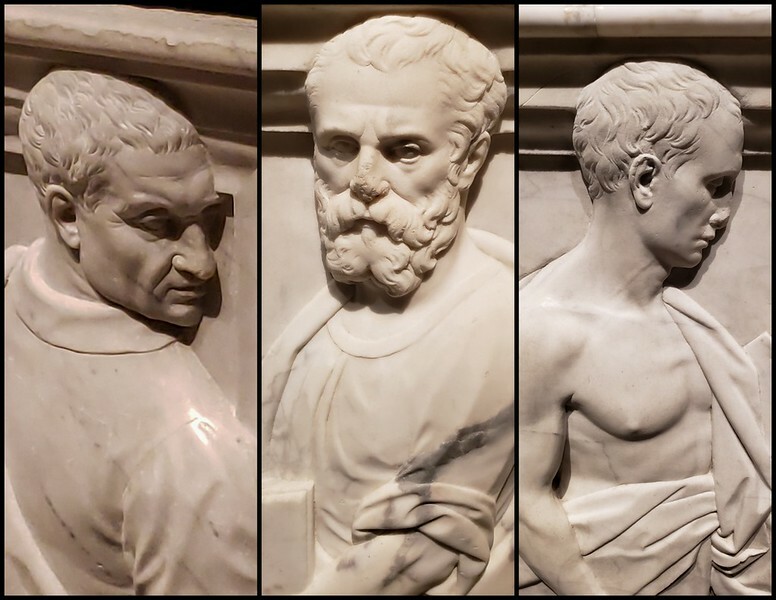 Between 1415 and 1435 Donatello and his pupils completed eight life-sized marble prophets for niches in the Campanile of the Cathedral, and we viewed these original sculptures in the Museum. 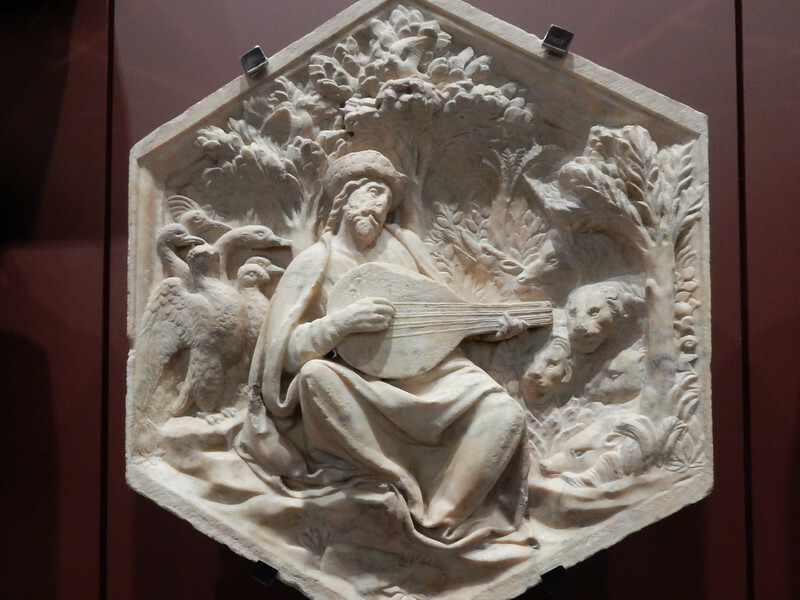 This wood carving was a complete departure of style and material for Donatello, and shocked the people of Florence. 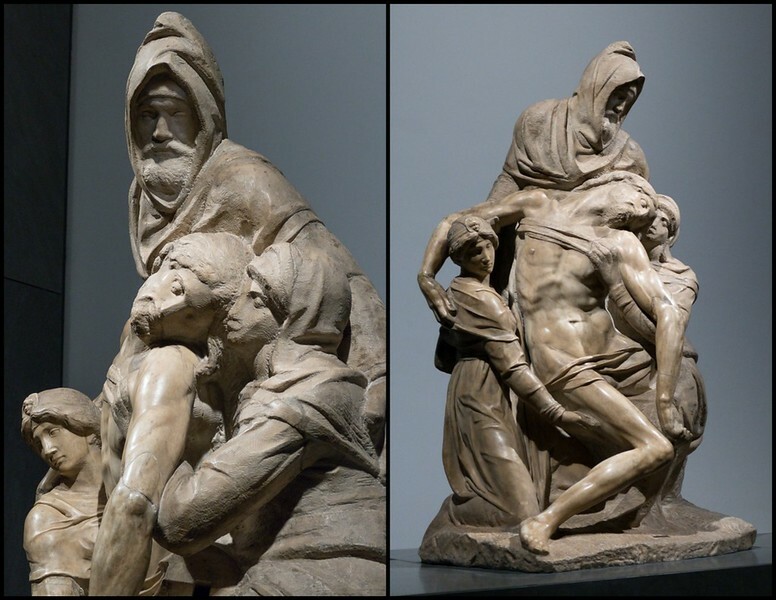 The carving was completed during the later years of Donatello’s life and reflected the intense depression he experienced at that time. Another display that we thoroughly enjoyed were the diamond-shaped, blue glazed panels that once decorated the Campanile, seven per side. The original design may have been Giotto, but his successor, Andrea Pisano and his assistants completed most of the panels. 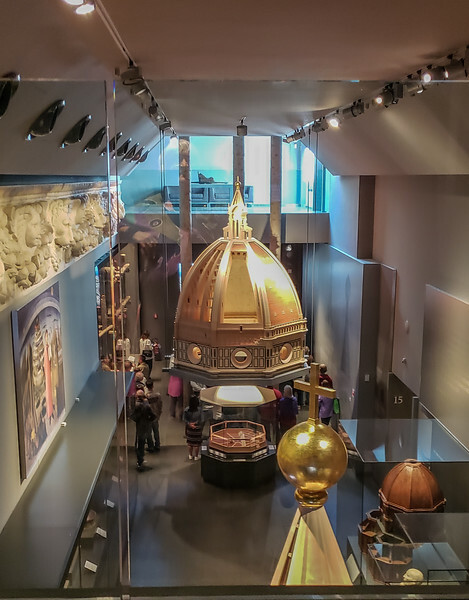 The gallery for Brunelleschi’s Dome contains the architect’s models and his death mask in addition to details about the construction of the brick dome that was the precursor to the dome at St Peter’s in the Vatican. We spent more than 2 hours in the museum. A happy circumstance was the lack of crowding. We did have to wait about half an hour in line to enter, but once inside the crowds were fairly well dispersed and not terribly intrusive. I took a LOT of photos, and my museum interior skills definitely need some honing. I will include some of them but if you want to see more here is a link to the rest of the photos for this day. We were darn tired by late afternoon after our first day seeing just the beginning of what Florence has to offer. Following our offline maps once again, we found a different route home, behind the Santa Croce Cathedral, and crossing the Arno River and the second bridge east from the Ponte Vecchio. It was a good route and we used it often in the coming days. Once again we cooked a great dinner with some of our stash from the fabulous COOP grocery, with fresh veggies, tomatoes and zucchini of course, a salad with lettuce that was the least exciting thing we ate in Italy, and a great little steak to top it off. We knew the next day would be another big one, and we fell into the almost decent mattress on the sofa bed with grateful hearts.